The Council of Protestant Churches of Cameroon (CPCC) has made recommendations for better organisation of elections and the need for peace in Cameroon. The Council of Protestant Churches in Cameroon (CPCC) whose 74 observers monitored the conduct of the October 7, 2018 presidential election has called on the people of Cameroon to preserve peace in the country which is a precious gift from God. In a preliminary declaration signed by the Secretary General of CPCC, Rev. Dr Paul Mbende Ngando, the Protestant Churches have recommended to political parties and candidates to seek legal means of resolving any litigations and abstain from all calls for force and violence. 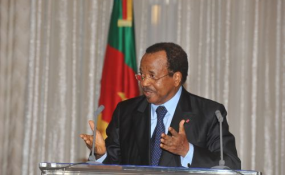 CPCC has also called on the Constitutional Council to show a high sense of responsibility so as to respect the choice of Cameroonian electors expressed through the ballot box and on Elections Cameroon as well as the Ministry of Territorial Ad ministration to take into account the organisational shortcomings so that future elections could be well organised. In all, the CPCC declared that the October 7, 2018 presidential poll took place in a generally appeased atmosphere despite security challenges, particularly in the socio-political crisis-stricken North West and South West Regions. The 74 observers of the CPCC monitored the elections in the Centre, East, Far North, North, North West, West, South and South West Regions. CPCC observers noticed that in the Local Polling Commissions in polling stations, only the candidates of the Cameroon People's Democratic Movement (CPDM), Paul Biya, Cameroon Renaissance Movement (CRM) Maurice Kamto and that of UNIVERSE, Cabral Libii were well represented. They further noticed that incumbent President Paul Biya's representatives were present in all the polling stations. The Protestant Churches lauded the efforts deployed by Elections Cameroon (ELECAM) in the organisation and management of the presidential election. Polling stations, according the Protestant Churches observers were generally opened in respect of the law, as well as the close of the voting operation. The observers appreciated the voting operation, stating that most of the polling stations were visible, voting effective in the North West and South West Regions in conformity with special security measures. On what has to be improved upon, the CPCC recommended that polling stations should be made more accessible to persons living with disabilities and elderly persons. The observers talked of the cases of some registered electors with voters card who did not find their names in the electoral registers. They also noted attempts of fraud by representatives of some candidates. The Council of Protestant Churches of Cameroon initially trained 880 observers and would have loved to see all of them accredited.